The Maxi-Cosi 2wayFix Base provides the best protection and the safest way of transporting your child, enabling rearward facing travel from birth up to approx 4 years old, giving you significantly enhanced protection for your child's head and neck.The 2wayFix Base is part of the 2 way family: a 2wayFix Base fits both pebble plus and 2way pearl car seats. The 2WayFix Base is very easy to use, thanks to its Isofix click-and-go installation system, which also provides visual and audio confirmation when you have correctly installed the car seat. Complies with the i-Size legislation when used with the 2wayPearl. 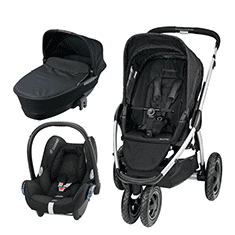 Doona Infant Car Seat Stroller-Racing Green + FREE Raincover Worth £24.99!